It's been one of those weeks. You know the kind. Too much stuff going on. Not feeling great. No time or energy for cooking or going out. Had to think of something I could throw together quickly and not mess up every pan and dish in the house. Only other requirement: flavor. Oh, and organic, of course. Of all the times to have completely run out of my stock of homemade freezer meals! I like to have at least five dinners in the freezer at all times, but the freezer was bare. I had flour tortillas and a jar of crushed tomatillos on hand, and that made me think of Chicken Enchiladas. Yeah, right! 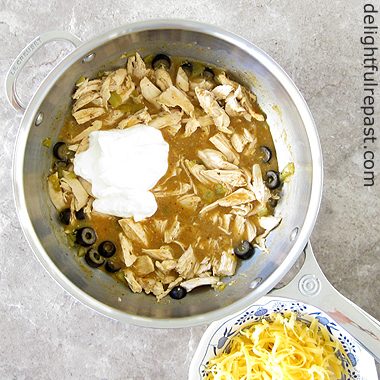 Chicken Enchilada Verde Casserole? Nope, today even that was too much work. So I just came up with a concoction that would cook in one pan and involved no chopping whatsoever. 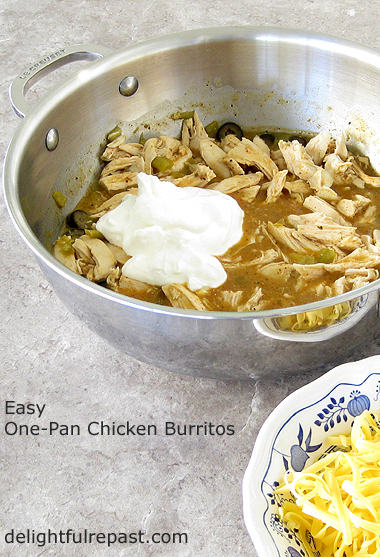 Just whip it up, wrap it in a tortilla and call it dinner. Every ingredient is a pantry staple. I didn't care that it has no vegetables. And I certainly wasn't going to be bothering with garnishes and side dishes. Phht! I threw stuff in a pan and sat down and had a nice cup of tea while it did its thing. Well, I did eventually have to grate some cheese. But one could use packaged shredded cheese. A burrito by itself is not very photogenic. That big expanse of white tortilla* looks pretty blah, but like I said, today was not a day for pretty garnishes. And anything remotely akin to photo styling was not going to happen, so there you have it. Sorry. * I used store-bought tortillas this time, but I love making my own Homemade Flour Tortillas when I'm having a better week. So tell me all about your latest sorry week! * I don't use commercial chili powder because it has salt, garlic and other things in it besides chiles. 1 In 12-inch skillet (or Le Creuset 3.5-quart stainless steel saucier), heat butter and oil over medium heat. Stir in flour, cook for about 1 minute. Whisk in chicken broth. Cook, stirring, until thickened, about 3 minutes. 2 Stir in tomatillos, chile powder, salt, pepper, oregano, cumin, green chiles and olives. Place chicken breasts in pan. Bring to a simmer and continue to simmer over low heat, covered, about 25 to 30 minutes, until chicken is cooked through. 3 Remove chicken from pan. While sauce continues to simmer, uncovered (so it can reduce a bit), use two forks to shred chicken into bite-size pieces. Return chicken to the pan. Stir in sour cream. 4 Spoon mixture onto warm flour tortillas, top with shredded cheese, and fold. Great with chopped avocado, cilantro, etc. I know those sorry weeks. So far this isn't one (apart from learning I will need some major expensive bathroom shower repair.) But believe me, I've had 'em -- so having a good go-to with things from the pantry is great! Hope next week is much better for you! Thanks, Jeanie! I'm starting to feel better, and certain stressful things are now behind me, so should be smooth sailing. I hate those home repairs that cost a lot of money and don't look any different! I don't even need the tortilla, just pass a spoon over, please :-) Yum! Sully, I never concern myself with the likes and dislikes of my major appliances! :D And, no, I don't have just two pans fighting it out; I have two entire armies of pans! Two gigantic cupboards of them. I don't dare count them. And that's after having given some of them away. But at least they aren't just sitting there. They all actually get their turn on the stage, er, stove regularly. Angie, a girl after my own heart. I did that very thing last night because I didn't want to eat another tortilla! I have been suffering from back ache since Monday. Need to get a deep heat rub. Apart from that everything is great. One daughter, Emily, on a tour of South East Asia. She visited the site of The Killing Fields in Cambodia last week which shocked and depressed her. Since then she has been snorkeling. As far as food goes, Em, stayed in a village out in the wilds with a local village family and ate tarantulas legs and drank some unspeakable homebrew. Vietnam beckons next week. Got any great tarantula recipes Jean? Tony, sorry about your back. Hope it's better soon. Em is far more adventurous than I! I'm not up to visiting The Killing Fields OR eating tarantulas and drinking homebrew! I do love an easy put together meal - this is something I haven't tried but since I have a bag of frozen tomatillos from my '16 garden that I didn't know what to do with, you have given me inspiration for what will be served in my home tonight! Rita, I hope you will. I'm actually going to make them again this evening! Cool, Mrs Shoes! I should mention, the Muir Glen Organic crushed tomatillos jar lists a couple of extra ingredients, a little lime juice and green bell pepper. So you might need to adjust for that. Let me know how it turns out! Thank you, Martha! And, yes, I am feeling better. Awww Jean, I'm so sorry that you've had one of those weeks. Yes, I've had those, too, but this week has not been bad. I love how you just pulled together some pantry staples and have a great meal. I still need to find those Muir Glen tomatillos that you use. I hope the rest of your week improves. Feel better soon and take care. Thanks, Kitty. :-) I'm getting better, so next week should be lovely! Try a natural foods store or a Whole Foods for the Muir Glen tomatillos. Even if they don't stock it, they can probably special order it for you. Things were so bad a couple of weeks ago that our Sunday dinner consisted of peanut butter sandwiches and we felt mighty glad to have that. The bread was bakery fresh so that made it more enjoyable. I hope that is my low point for a while. Not even the energy to brew a cup of tea. Oh, Nancy, I do hope that was your low point for some time to come! I love peanut butter and good bread, so I would have been okay; but Mr Delightful only likes peanut butter in cookies! But I don't mean to make light of your experience. Thanks so much for commenting. You had me at burrito. Mexican is a huge comfort food go to for me. I almost feel guilty for saying this -- but we're those sorry folks who have quite a bit in the freezer. Now, I have to explain that it's just hubby and I so when we make a nice meal we may freeze the rest to enjoy later. If our kids lived closer I'm sure our house would look like the locusts invaded it. Your recipe sounds fantastic. I'd buy the ingredients just to make it. Marisa, thank you. Isn't it just the best feeling to have a lot of meals in the freezer?! When I pop my head in there and see all my lovely glass storage containers filled with homemade freezer meals, it makes me glow! :D And I've noticed this past week that NOT seeing them in there makes me feel a bit anxious. Love the look of this recipe ("easy" and "one-pan" are clearly hot buttons for me) but I also drew comfort from reading about challenges others have faced and the creative meals which result. Yes, it would be great to always have freezer meals on standby, but sometimes that just isn't the case. In our house, baked beans on toast (kind of a British thing) is basically the fallback. Pauline, thank you. Your fallback would work well for me - in fact, I made that very thing for my solo lunch a couple weeks ago - but my husband thinks baked beans on toast is very odd! :D Silly man. I am most definitely doing this, Jean. Thanks! Those olives caught my eye. I'm a big fan. I have little excuse this week except for the gray, cold weather which has left me feeling tired. I need sun!! Thanks, Judy! I love olives, too. My husband is not a fan of gray, cold weather either. He is energized by sunshine. And I am exactly the opposite! I have had a craving for this type of meal in the WORST way- with handfuls of cilantro please! Yes, handfuls - I LOVE cilantro! Thanks, Kristin! Your recipe looks great. Last week when I was out we had a burrito in a bowl, it was good too. Thanks, Kathleen. Yes, getting better every day. Have a massage scheduled for tomorrow morning, and that always sets me right! We just had chicken burritos last night. Will have to try out your recipe. Thanks for linking up with #BloggingGrandmothersLinkParty. Candace, thank you. I hope you will! Though I'm sure yours were just wonderful! Fabiola, thank you! I would've thrown in a jalapeno, too, if I'd had one on hand! Still haven't tried your method but I am going to. Thank you Jean for sharing this post at the #BloggingGrandmothersLinkParty. I shared it on social media. Thanks so much, Grammy Dee. Much appreciated! Lori, thank you. I hope you'll try them soon and like them as much as we do! I'm sorry you had one of 'those' weeks but happy you shared this recipe! It's definitely going on my list of those to try. I noticed a few other recipes of yours I'm going to put on that list too! Thanks so much, Empty Nester! Let me know how the recipes turned out for you. It is actually my April goal to make homemade flour tortillas! I know this means using more than one pot, but it will be worth it! Love your filling, Jean! David, thank you. AND thank you for reminding me to add a link in this post to my Homemade Flour Tortillas post! Have fun with your tortilla making. This looks good and I love the fact that the ingredients are all ones that you should already have. Thank you for sharing at the #BloggingGrandmothersLinkParty. I have shared on social media. Thank you, Clearissa. Much appreciated! Thank you, Dawn. If only I could get my husband to eat beans on toast! I had that for lunch one day last week, and he once again expressed his disdain for the classic dish! Can't wait to check out your latest brilliant rhymes on my next break. Hi, Jean sounds like a great recipe for "one of those days" :-)! I will try it out since lately I have very little time on hand for cooking but still, want to eat something halfway healthy and homemade. I would just add some veggies to it. Thanks for another great recipe! Hope this week is going better for you! Christina, thank you. It's difficult in most places for those of us who eat organic food to find organic takeout, so ... And by all means, add some veggies or even leftover rice or beans to the burritos. That's what I love about burritos! And thank you so much for the poundcake recipe! I've been searching for a good one for years. Thanks, Rue! It's funny how that happens, but it does! Often quick and easy meals are the nicest. And this looks seriously yummy. Thanks, Amalia. I think I'm going to be doing more quick and easy! Thanks, Bridget! Burritos are one of my faves - you can just wrap up whatever you have on hand, throw on some cheese and there you go! Diane, thank you! I hope you'll try it soon!